When most people think of yoga, they think about twisting their bodies into a pose that resembles some sort of a pretzel. (If you’re a runner, you then think about how good a pretzel would be right now, and about how much you love carbs.) But, the mental part of yoga is just as important (and sometimes even more important) as the physical part. 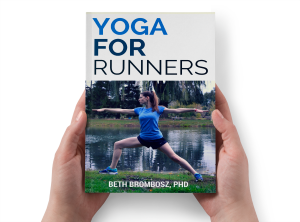 Runners can learn a lot of mental lessons from yoga that they can use to become better runners. Here are three top lessons runners can learn from the mental side of yoga. People who aren’t runners (and even some who are) like to talk about how boring running is. Unless you’re running with a partner or a group, there may not be a lot going on around you. It’s very easy to let your mind wander. You think through your to-do list, a conversation you had with your boss earlier in the week, or, more often than not, what you’re going to eat for breakfast when you get home. Mental distraction can help keep our minds busy on “boring” runs. But, it can also be very destructive. If you’re distracted, you might miss out on catching the first few twinges that are telling you you’re about to get injured. If you’re distracted, you may not be paying attention to how your pace feels, which could help you run better during your next race. If you’re distracted, you’re ultimately missing out on an opportunity to become a better runner. My challenge to you: stay mentally present on your runs. Listen to your breathing. Listen to your body. Even take a moment to enjoy the beauty around you if you run outside. The rest of the world will be there when you’re done with your run. But, if you start to take each run for what it is and live in that moment, I think you’ll enjoy running even more. When things get tough, our breath is often one of the first things to go. In both yoga and running, our minds tend to immediately focus on how hard we’re working. Unfortunately, when you focus on your discomfort, you tend to have a shallow breath, which means you’re getting in less oxygen. Luckily, you’re in control of your breath. Often when you’re in the toughest part of your run—the last few miles of a tempo run or even a race, or the last few repeats of an interval workout—you tend to forget about your breath. If you can stay aware of your breath and focus on taking full, deep belly breaths, it will help your running tremendously. For me, the biggest lesson I’ve learned from yoga and applied to my running is that I am in control of my thoughts. I really notice this on difficult runs, or when my runs just aren’t going like I’d hoped. I used to stew about how I wasn’t hitting the splits I wanted, or how tired I felt, or how I was never going to be ready for my race. All of those negative thoughts had a big negative impact on my runs. With my yoga practice, I learned how to control what I was thinking. I learned to be mindful and to stop those negative thoughts. Now, instead of dwelling on what might be going wrong, I start to focus on my running form and my breath. I focus on the things I can control. Once I start to turn my thoughts around, my runs usually turn around, too. Suddenly I’m running faster and running feels easier. Your thoughts really can have a huge effect on your running. Ha! We are talking about very similar topics today! I love this! 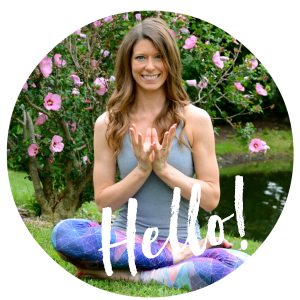 Mental yoga…I know that I’ve learned to be very mindful while running, noticing a twinge here or when my breathing is heavier than normal. I do need to work on fewer negative thoughts while running! I love this! I’ve been trying to use some of the lessons I have been learning in yoga for other parts of my life. You know how much I agree with the yoga/running relationship. I think they are the perfect pair! I think my comment disappeared! I do tend to run mindlessly or listen to a book when I run. These are all great ideas that I can incorporate to be more mindful! Thanks! I love running because it’s the time I feel most connected to my body. Even though I often listen to Podcasts on the run I still get lost in my own thoughts.